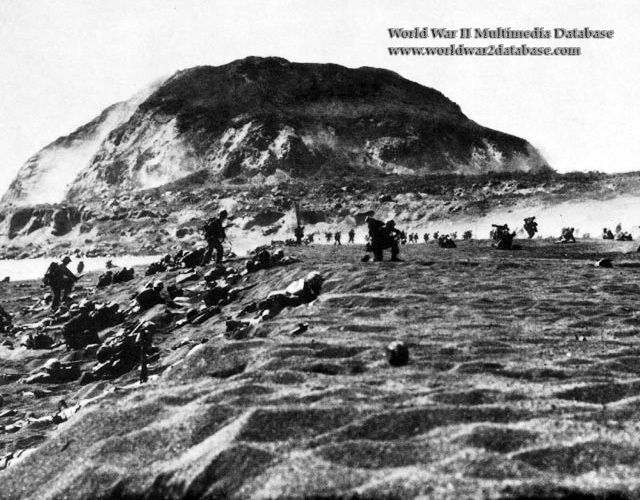 Infantry of the US 5th Marine Division moves ashore under the guns of Mount Suribachi. This photo was likely taken in the first twenty of the invasion, before Imperial Japanese Army General Tadamichi Kuribayashi gave the order to fully open fire, since so many men are upright. The Japanese had 361 artillery pieces of 75mm or larger caliber, a dozen 320mm mortars, 65 medium (150mm) and light (81mm) mortars, 33 naval guns 80mm or larger, and 94 antiaircraft guns 75mm or larger. In addition to this formidable array of large caliber guns, the Iwo defenses could boast of more than 200 20mm and 25mm antiaircraft guns and 69 37mm and 47mm antitank guns. The garrison also had over 350 machine guns. The fire power of the artillery was further supplemented with a variety of rockets varying from an eight-inch type that weighed 200 pounds and could travel between 2,000-3,000 yards, to a giant 550-pound projectile that had a range of more than 7,500 yards. Altogether, 70 rocket guns and their crews reached Iwo Jima. As a result of American attacks against Japanese shipping, a number of artillery pieces were lost. Others reached Iwo, but their crews, traveling on other ships, drowned en route. In several instances, guns and crews arrived intact, only to discover that vital optical sights, shipped on other vessels, had been lost. All the guns that could be sighted on the beach opened fire between 0920 and 0930 Hours. Casualties mounted quickly.